Inventory We are a resale marketplace, not a box office or venue. Ticket prices may exceed face value. This site is not owned by Ascend Amphitheater . The Ascend Amphitheater is the newest outdoor venue in the Music City to bring some of the hottest acts to an open-air setting. The modern 6,800 seating capacity venue will be located along the west bank. 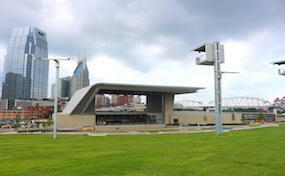 The Ascend Amphitheater box office is located at 310 1st Avenue in Nashville, Tennessee. Ascend Amphitheater tickets are scheduled to open with Eric Church and continue with a variety of acts from Phish, Steely Dan, the Smashing Pumpkins, Idina Menzel, Peter Frampton, and many more. Ascend Amphitheater was originally intended to be a baseball stadium, but after multiple financing delays the idea was scrapped in early 2007. Construction began on the amphitheater in 2013, but the land was in continuous use before that. The plot of land was used for city festivals and other such events, making it a widely known space before anyone broke ground. This added to the excitement of the citizens of Nashville, making Ascend Amphitheater a huge success once opened. AmphitheaterNashville.com is an independently owned and operated site that specializes in all events in the secondary resale marketplace. We are not associated with any primary box office, venue, and or official website. Prices on our sites tend to be above face value and will change quickly with market conditions. To order tickets for all Ascend Amphitheater Nashville events follow the process online or pick up the phone and call our sales staff at anytime.